We are big fans of the Louisville Distilling Company and Master Distiller Lincoln Henderson’s Angel’s Envy Bourbon. Angel’s Envy was one of the first significant brands to build their product around bourbon finished in port casks. Since then, finishing barrels have become an important part of the premium whiskey space and several companies (like Big Bottom Whiskey) have followed in Angel’s Envy’s footsteps. For Angel’s Envy, the concept was always to release a number of different batches of finished whiskey. The first round we reviewed got top marks from us, so we were excited to hear of another special limited release from the company. 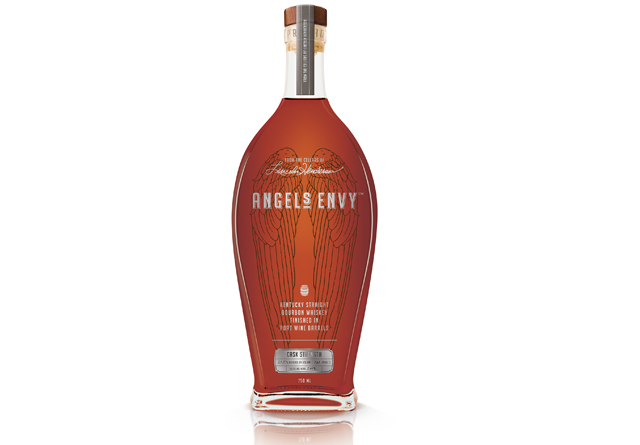 Angel’s Envy Cask Strength Port Finished Bourbon Whiskey (121 Proof / 60.5% ABV, $149) – this limited edition release is painfully small with only 600 bottles released in Kentucky and Nashville. The special release features a perfume grade glass bottle, ceramic stamped, hand filled, and corked. Clearly aimed at the super whiskey enthusiast, purchasers of this special release will get a special invitation for a unique event to be held in January 2013 with Master Distiller Lincoln Henderson. Dark amber in color, Angel’s Envy Cask Strength is significantly darker than the standard release. It’s clear that the spirit has spent much more time in the port finishing barrel and it’s taken on some of the dark tones from that barrel. The port finish is also clearly there on the nose which combines the lush port note with oak spice, clove, marzipan, and vanilla. The entry is extraordinarily approachable for a high proof spirit, with soft fruit and vanilla leading the charge with a gradual transition to oak spice in the midpalate. Things do get spicy and slightly fiery towards the end of the midpalate with solid oak, black pepper, and clove stepping out in front of the more lush sweet notes. The spirit does manage to maintain some balance between the strong spice and the sweet undertones, but that balance is elusive as the flavors exit quickly in a very dry finish. Angel’s Envy Cask Strength isn’t a subtle product – it’s playing in a space with big bold whiskies like George T. Stagg – but it does manage to be bold in flavor without being too strong. Still, one of the things that really draws us to Angel’s Envy is it’s balance and finesse, the integration of flavors, and the play between the bourbon and port. Here those elements aren’t as balanced and there just isn’t the same level of finesse. Also, we just don’t love the finish, which is too dry with flavors disappearing before we’re done enjoying it. While we prefer the standard Angel’s Envy, we imagine that rabid whiskey collectors will jump all over this release even at the high price tag. It’s great to see interesting releases like this in the whiskey category, but it’s also a great example that cask strength doesn’t always mean better.